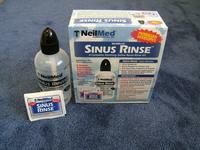 Sinus irrigation and sinus rinse products provide safe, easy, effective sinus relief! Reduce your meds! 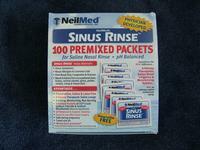 Sinus Rinse Nasal Rinse Kit comes with 50 packets of easy to dispense USP Grade, Preservative Free Sodium Chloride and Sodium Bicarbonate mixture (pH balanced & isotonic for maximum comfort). Easy-squeeze bottle comes with volume marker. Each packet contains precisely measured mixture to mix with 8 oz. (240 ml) of lukewarm distilled water, taking the guesswork out of preparing this solution. The kit also contains directions for use and extensive educational material that is simple to understand. Each box has 100 premixed packets. Makes a perfect preservative free and iodine free solution every time. Convenient. Economical. Educational brochure and Instructions also included. 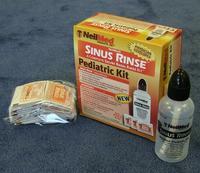 Pediatric Sinus Rinse Kit - children will love it too! Sinus Rinse Pediatric Nasal Rinse Kit comes with 50 packets of easy to dispense USP Grade, Preservative Free Sodium Chloride and Sodium Bicarbonate mixture (pH balanced and isotonic for maximum comfort). Easy-squeeze bottle comes with volume marker. Each packet contains precisely measured mixture to mix with 4 oz. (120 ml) of lukewarm distilled water, taking the guesswork out of preparing this solution. The kit also contains step by step directions for use and extensive educational material that is simple to understand. 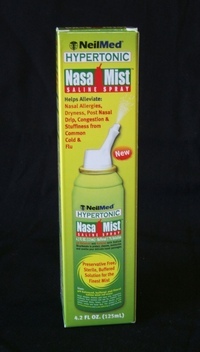 NeilMed Hypertonic NasaMist Saline Spray - Helps Alleviate Allergies and symptoms from colds and flu! Easy to use! pH balanced and Buffered to protect, cleanse, moisturize and soothe delicate nasal passages! NasaMist Saline Spray is a hypertonic (more salinity than your body) saline solution designed to provide relief from nasal allergies, dryness and congestion. Contains no irritating preservatives. No mixing necessary. The specially designed nozzle provides a gentle mist for both adults and children. Safe to be used during pregnancy. Non habit forming. All at a great new low price. Great New, Patented Bottle Shape! Nasopure has a great new design for a sinus irrigation bottle. That little curve at the neck makes it very easy to use and very effective. It allows you to keep your head upright. Designed by Dr. Hana Solomon, a Pediatrician, it has been proven by hundreds of patients. We just tried it. It works! You'll like it. The starter kit comes with 9 packets of nasal wash salt mixture in just the right ratio of salt to sodium bicarbonate to produce the best results. This is enough to produce 72 ounces of hypertonic saline solution or 144 ounces of isotonic solution. Here's the best part - Dr. Hana supports her product herself. If you ever have a question about nasal washing, just e-mail her at DrHana@nasopure.com. 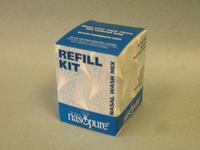 Nasopure refill packets are the same highly recommended blend of salt and sodium bicarbonate in just the right ratios. Kit comes with 20 packets. 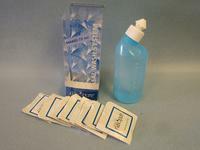 Each packet makes 8 ounces of hypertonic solution or 16 ounces of isotonic solution. 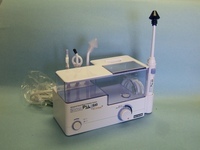 The SinuPulse Sinus Irrigator Tip is designed to be used with the SinuPulse Elite and most WaterPik® models. Simply mix a saline solution in the basin of the Water Pik®, attach the tip and cleanse the sinuses. Medically proven to treat sinusitis, allergy, post nasal drip and snoring. Safe as blowing you nose. Breathe easier ... the drug free way. 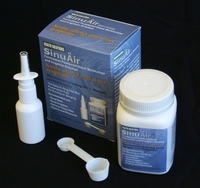 SinuAir - Soothes allergy and sinus symptoms! SinuAir is physician recommended 100 natural alternative to the many over the counter nasal sprays and saline products that contain irritating preservatives. SinuAir's unique formulation has been specifically designed to gently cleanse, soothe and moisturize nasal passages. Preservative and Iodine free. May be mixed as an Isotonic or hypertonic solution. Mixes easily with distilled, filtered or previously boiled water. 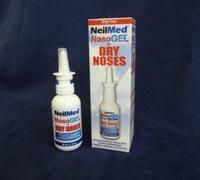 Entsol Nasal Gel - instant and effective relief of dry, stuffy, irritated nasal passages! Entsol Nasal Gel is a drug-free, hypertonic saline nasal formulation that relieves dry, stuffy, irritated nasal passages due to sinusitis, rhinitis, allergies, pollen, dust, coughs, colds, congestion and low humidity. Apply around nostrils, under nose and immediately inside nostrils to remedy discomfort. 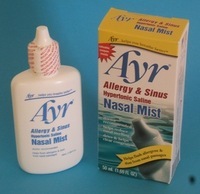 Ayr Nasal Mist - Helps flush allergens and dust from the nasal passages! Ayr . . . Helps you breathe better. New! Swiss Design Combines Sinus Rinse and Moisturizing Mist! The SinuPulse Elite Advanced Nasal Irrigation System is state-of-the-art to help relieve symptoms of sinusitis, allergies and congestion. It is the only device that combines the moisturizing and deep penetrating action of a spray mist and the cleansing of sinus irrigation. The SinuPulse was designed and engineered in Switzerland and is recommended by leading ENT's, Allergists and Pediatricians. 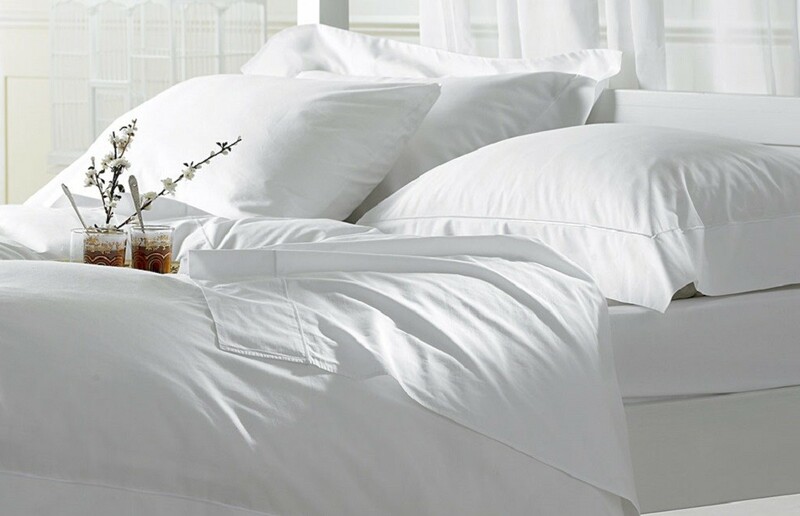 It effectively reduces swelling, reactivates the cilia and cleans out allergens and other irritants. Comes with two nasal tips and two tips for throat cleansing. 30-day supply of sinus irrigation formula packets included.